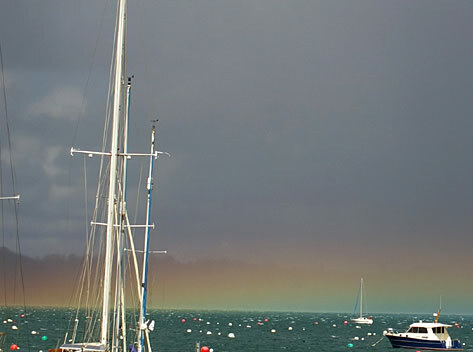 Rainbow at Mylor Harbour, Falmouth, Cornwall UK imaged by Linda Bennett at 14:45 local time on March 28, '07. Only the top of the bow peeks above the sea. Rainbows are about 42° in radius and centered on a point directly opposite the sun - the 'anti-solar point'. Here the sun was 39° high and so the anti-solar point was that distance below the horizon.  The Rainbow tip was therefore only 42-39 = 3° above the horizon. Image ©Linda Bennett, shown with permission. At sunrise or sunset a rainbow's centre, the antisolar point, is on the horizon. The rainbow is half in the sky, a semicircle. As the sun rises the bow's centre sinks. 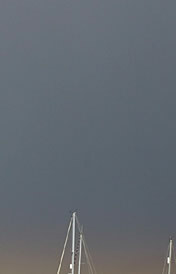 Eventually when the sun is 42º high only the tip of the bow is visible above the horizon. In the summer, rainbows are best seen in early morning or late afternoon when the sun is comparatively low. Parts of a bow can often be seen below the horizon against a backdrop of fields or the ground. A more complete circle is sometimes visible from mountains or aircraft.